Why Would You Can Simple Syrup? By canning the syrups in 1/2-pint jars, you can just open a jar anytime you need just a cup for a few recipes. The syrups are there on your pantry shelf, ready to go – even in the dead of winter. Now you can make simple syrups from just about anything, but I think rhubarb-vanilla syrup is just this side of heaven. It is by far the most amazing thing you will ever add to your tea. I swear! Watch the video above to see how easy it is. The printable recipe is below. I also have posts on Making Jam Cocktails and Making Homemade Liqueurs. Or you can watch all the Canning Videos that we have on site. 1) In a medium-sized saucepan, combine rhubarb and water. Cook over medium heat for about 10 minutes or until rhubarb is broken down. 2) Strain through cheesecloth. For clear syrup, do not press the rhubarb. Instead let the mixture sit overnight to strain. Or if you do not mind a little cloudiness or if you are in a hurry, let the mixture sit for about 20-30 minutes. Then, press the rhubarb with a wooden spoon to release the juices. Discard the pulp. 3) Fill your water bath canner with water and heat it up. Add your clean jars to the bath to heat while you continue the recipe. Prepare your 2-piece canning lids in a pan of warm water. 5) Pour the 3 cups of liquid to a saucepan and add 3 cups of sugar. Add lemon juice and cardamom. Take the split vanilla bean and scrape out the seeds. Add the seeds and split bean to the pan. Bring the mixture to a simmer until sugar is dissolved (about 5 minutes). Remove vanilla bean (and save it for something else). 6) At this point you can stop and use the simple syrup. Just store the remainder in the refrigerator for up to 3 weeks. Or you can continue with canning the syrup and it will last on the pantry shelf for up to a year. 7) Remove your hot jars from the water bath and fill with the hot syrup. Leave 1/4-inch headspace. Wipe the rims and add your lids and rings. Process in the canner for 10 minutes. Turn off the canner and let it sit 5 minutes with the lid off. Then remove the jars and let them cool on a wooden board. 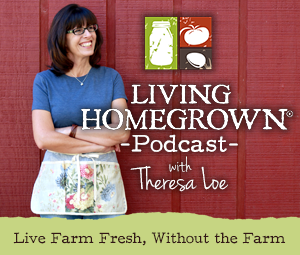 For more canning tips and recipes, visit my canning blog. Hi, I make a not so simple blue berry, mango and strawberry syrup (I run mine through a fine food mill as I enjoy just a bit of the fruit flesh in my syrup). Would this change the processing time for canning? No, the same process time would apply. That sound delicious! I would like to use my lemon basil and add some of my mint to make simple syrup for cocktails. Do I keep the water and sugar ratios the same and steep the leaves and flowers (remove/strain) and add the lemon juice in the same ratio? Thanks for all the great info! This is my first year canning and I want to make sure all is safe! Yes Allison, that is what I would do. Sounds yummy! Where do you get those syrup bottles from? I just found you.r website and love it! I have a quick question about the syrup after you have canned them. Once you open them, what is the shelf life in the refrigerator? I sell fresh lemonade at a local farmers market and have been asked to offer some of my flavors for sale, but want to be able to offer a shelf life to people. Thank you in advance for your insight. If the syrup uses a 1:1 ratio of sugar to water/juice, the sugar helps preserves it. It should last 4-6 weeks in the refrigerator. Perhaps longer, but I would say 4-6 to a customer. I’m canning some lavender simple syrup. I use 1 cup of water to 1 cup of sugar. From reading above, it looks like I need to increase the sugar to 2 cups sugar per cup of water. Is that correct? It all depends on how sweet and how thick you want your syrup. There is no set answer. I would start with the 1:1 ratio and see how you like it. Lavender is not bitter, so I think the ratio will give you a nice syrup. Adding more sugar will give you a thicker syrup as well as sweeter. When I make lavender syrup, I have made it both ways. Both are good. It is a personal choice. Not a safety choice. Thanks so much for your reply! I’m having a hard time finding safety guidelines for canning syrups and if I need to add lemon or sugar to prolong preservation. Can you lead me somewhere on your site or off site? Thanks again and I really appreciate your wonderful page! I made mint syrup. After straining the mint through a mesh colander I put the left over mint in my salad spinner. (I was making a very large batch.) I ended up spinning another three cups out. The left over mint was dryer than when I started. I am happy to report that my syrup is awesome. Jessica – That was a brilliant idea about the salad spinner. So glad the syrup is awesome! Hi, my daughter is going to Europe next summer so she’s making sand plum jelly as a fundraiser. I was wondering what you’re thoughts &/or tips for making sand plum syrup? I have never made sand plum jelly and in fact, was unfamiliar with the fruit until I googled it. It sounds great! Making syrup is great way to use up large quantities of fruit. I actually have a post coming up soon on making plum syrup (with standard plums). But the process is the same with all fruits. All you do is boil the fruit until it breaks down. You may need to add a little water to the bottom of the pan to get it started so it doesn’t burn. Once the fruit is broken down. Turn off the heat and strain the fruit through cheesecloth or a strainer to get the skins and seeds out. Then, measure the amount of juice you have and add equal amounts of sugar to a heavy bottomed stock pan. I also add a little bit of lemon juice to bring out the flavor (about tablespoon per cup of juice). Bring juice/sugar/lemon juice to a boil and cook until sugar is completely dissolved. Pour into clean 1/2-pint canning jars, wipe rims and add lids. Process in a water bath canner for 10 minutes. Let me know how the sand plum syrup turns out! Hi, I made rhubarb syrup for the first time today and I loved it. I was looking for a way to can it, and I found your website. I really enjoy your site. When I made my syrup I only used 3 tbp of honey. I really like the syrup tart. Is it safe to can it using honey instead of sugar? Thank you. I’m so glad you found me here. 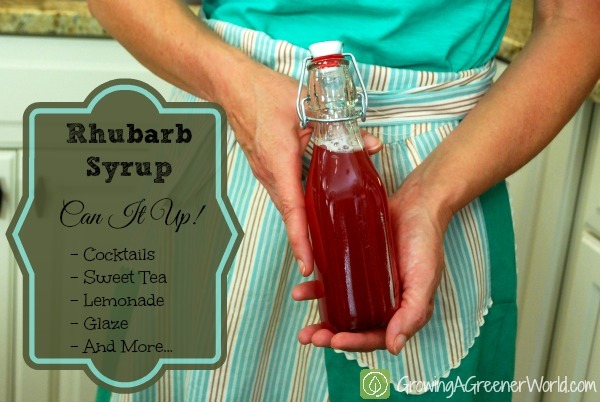 I love rhubarb syrup too. Yes, you can put up your honey-sweetened syrup. Use the same times, etc in my recipe. The sugar in this syrup recipe is really there for flavor, not preservation. However, on your next batch I would include lemon juice (like I did) so that you can be assured that your pH is well within the safe zone. It is the pH that keeps this recipe safe for water bath canning. Most veggies are not safe for water bath canning (unless they are acidified somehow), but rhubarb has a high acid pH making it safe for what we are doing. Not only that, but the lemon juice helps brings out more of the rhubarb flavor. You could reduce the lemon juice to 1/4 cup if you wish, but since you like tart…it make be just right for you. If you have not canned your syrup yet, add a little lemon juice before you do and be sure to heat your rhubarb syrup before putting it into the jars. (To a simmer would be fine) You want hot liquid in the jars so that the internal temp will reach the correct temp for the time I have in my recipe. A friend of my brother wants to can his own margarita mix. He wants to use bottles not canning jars. I see in your picture above the bottle with the wire crimping lid. Where can he find the bottles and can they be water bath canned? Are there any bottles that can be water bath canned or are they just for decorative immediate use? That bottle in my photo is not water bath processed. It is just for immediate use only. However, your friend could use some very pretty Weck canning bottles (specifically the “juice” bottle) to put up his mix. Weck jars are very popular in Europe and they use a rubber gasket, a glass lid and clips. What I like about them is that you can easily see if you have a good seal or not because the rubber gasket tongue tips down when sealed. Also, after you open it, you can use a little plastic cap to store it in the refrigerator. The down side is that they are expensive and he is wanting to give these as gifts, they are a bit costly. But for his own use they could be used over and over again each year. He only needs to replace the inexpensive gasket each time he cans with the jars. I’m hoping to preserve hibiscus using the 2/1 syrup ratio but wonder if you think I ought to strain the flowers out and just keep the syrup on its own? (I think would be nice to keep them if it’s safe to do so). And can I use the 1/4 inch headspace, 10 min for processing? Thanks very much for your advice – beautiful recipes here! Your hibiscus syrup will be so pretty – especially if you are using red flowers! I’m sure the color of the flowers will come through nicely. Yes, you can use that ratio for the syrup. As for keeping the flowers or not, I would strain them out. After heating, fresh flowers will look slimmy and dark. If you are using dehydrated flowers then I would strain them out and add fresh to the bottle. But they will sink to the bottom and again…I do not think they will look that pretty. You might need to experiment. Yes, the headspace and timing should be kept the same. Let me know how they turn out! I like a tart syrup. Can you make this with less sugar or will it ruin the consistency? Sounds delicious! Some of the sugar in this recipe is helping with preservation and color retention. You could reduce the sugar in this recipe to 2 cups and still get the preservation benefits. It would be tart. If you want even less sugar, you could certainly make it and not can it. Depending upon the amount of sugar you did use, it would store in the refrigerator for 1-3 weeks. Could you can something like brown sugar vanilla syrup that we put in coffee? Would you water bath it and how long? We would like to give it away as gifts for the holidays and wanted it canned. Thank you. Oh yum Connie – That sounds good! Yes, you should be able to make your brown sugar vanilla syrup. The important part is keep at least 2 parts sugar to 1 part liquid. Don’t dilute the sugar solution any more than that. My only concern would be that I have never canned brown sugar syrup and I wonder if it separates over time? (Brown sugar has molasses in the mix) My guess would be no and it would work perfectly. But even if it does separate over time, a good shake in the jar before using would take care of that. Any separation would be purely aesthetic. It would still be safe. Use the same waterbath times given in this rhubarb recipe. Let me know how it turns out!